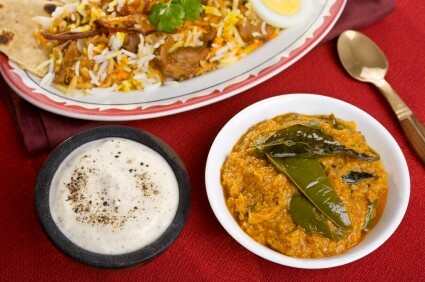 The specialty dish is Hyderabadi Biryani, a meat and rice dish. Shown above are the traditional accompaniments for Hyderabad Biryani, namely Chilli Curry and Burrhani Raita, which is yoghurt with fesh garlic, black rock salt and other spices. Top of the line Hyderabadi food in a noisy and crowded environment. Top of the line multi cuisine with a wide selection of traditional Hyderabdi food in elegant surroundings.